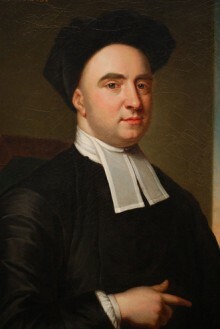 Bishop George Berkeley (1685 - 1753) was an Irish philosopher of the Age of Enlightenment, best known for his theory of Immaterialism, a type of Idealism (he is sometimes considered the father of modern Idealism). Along with John Locke and David Hume, he is also a major figure in the British Empiricism movement, although his Empiricism is of a much more radical kind, arising from his mantra "to be is to be perceived". He was a brilliant critic of his predecessors, particularly Descartes, Malebranche, Locke and Hobbes, and a talented metaphysician capable of defending the apparently counter-intuitive theory of Immaterialism. He also had some minor influence on the development of mathematics (and calculus in particular). George Berkeley (pronounced BARK-lee) was born on 12 March 1685 at his family home, Dysart Castle, in County Kilkenny, southern Ireland. He was the eldest son of William Berkeley, a member of the junior branch of the noble English family of Berkeley. He was educated at local Kilkenny College and then, in 1700, at Trinity College, Dublin, where he completed his undergraduate degree in 1704, went on to become a Junior Fellow in 1707. He was ordained in the Anglican Church in 1710, but he remained associated with Trinity College until 1724 (after completing his doctorate, he became a Senior Fellow in 1717, and then became a tutor and lecturer in Greek), although he was not continuously in residence. His most widely-read works ("A Treatise Concerning the Principles of Human Knowledge" of 1710, and "Three Dialogues between Hylas and Philonous" of 1713) were published at a relatively early age, during his Trinity College years, and he spent much of the rest of his life defending them. In 1713, he went to London to arrange publication of the second of these, and there he befriended some of the intellectual lights of the time, including Jonathan Swift (1667 - 1745), Joseph Addison (1672 - 1719), Richard Steele (1672 - 1729) and Alexander Pope (1688 - 1744). From 1714 to 1720, he interspersed his academic endeavors with periods of extensive travel throughout Europe. In 1721, he took Holy Orders in the Church of Ireland, earned his doctorate in Divinity, and once again chose to remain at Trinity College, Dublin, lecturing on Divinity and Hebrew. In 1724, he was made Dean of Derry and moved away from Trinity, but in 1725 he gave up this position to pursue plans to found a seminary for training missionaries in Bermuda. In 1728, he married Anne Forster, daughter of the Lord Chief Justice of Ireland, and together they moved to Rhode Island in America and bought Whitehall Plantation, where he wrote the bulk of "Alciphron" (his defense of Christianity against free-thinking). But, when the money for his proposed missionary college did not materialize, he moved back to London in 1732, where he was one of the original governors of the Foundling Hospital, a home for the city's abandoned children. In 1734, he was appointed Bishop of Cloyne in Ireland, an economically poor Anglican diocese in a predominantly Roman Catholic country, where he remained for the next 18 years (and during which time he produced a work on mathematics and calculus, and two popular books on the medical benefits of pine tar). In 1752, he retired to Oxford to live with his son, George, (one of his seven children, although only three lived to adulthood). However, but he died soon afterward (on 14 January 1753) and was buried in Christ Church Cathedral, Oxford. Berkeley's earliest published works were on mathematics and on optics (the latter, dealing with matters of visual distance, magnitude, position and problems of sight and touch, was controversial at the time, but became an established part of the theory of optics). But all the philosophical works for which he has become famous were also written while he was still a young man in his 20s. In 1710, still only 25 years old, his "Treatise concerning the Principles of Human Knowledge" was published, his first exposition of the then revolutionary theory that objects exist only as perception and not as matter separate from perception, summed up in his dictum "Esse est percipi" ("To be is to be perceived"). The work is beautifully written and dense with cogent arguments, no matter how counter-intuitive the system may appear at first sight. He called the theory Immaterialism (conceived as it was in opposition to the prevailing Materialism of the time), although it was later referred to by others as Subjective Idealism. The theory propounds the view that reality consists exclusively of minds and their ideas, and that individuals can only directly know sensations and ideas, not the objects themselves. The position that the mind is the only thing that can be known to exist (and that knowledge of anything outside the mind is unjustified) is known as Solipsism, and forms the root of the later doctrine of Phenomenalism. It can also be seen as an extreme type of Empiricism, whereby any knowledge of the empirical world is to be obtained only through direct perception. Berkeley, recognizing the possible theological loopholes in his theory, argued that if he or another person saw a table, for example, then that table existed; however, if no one saw the table, then it could only continue to exist if it was in an infinite mind that perceives all, i.e. God. He further argued that it is God who causes us to experience physical objects by directly willing us to experience matter (thus avoiding the extra, unnecessary step of creating that matter). So, Berkeley's view of reality might be summed up as follows: there exists an infinite spirit (God) and a multitude of finite spirits (humans), and we are in communication with God via our experience. Thus, what we take to be our whole experience of the world is analogous to God's language, God's way of talking to us, and all the laws of science and Nature we see around us are analogous to the grammar of God's language. There is, then, in this theory, no need to postulate the existence of matter at all, as all reality is effectively mental. Although usually counted among the British Empiricists, Berkeley's Empiricism is of a much more radical and tenuous kind than that of Locke or Hume. Berkeley believed that, for an idea to exist, and for someone to be aware of it, were essentially the same thing ("to be is to be perceived"), and that it was only through experience that we can know about these ideas. A Rationalist would suggest that it is our intellect that enables us to penetrate beyond these surface experiences, and to grasp the underlying substance to which all the various qualities adhere. Berkeley, however, declared unequivocally "Pure Intellect I understand not", and maintained that the sensible qualities of bodies and things are all that we can know of them. In that respect, then, he was an Empiricist, although he differed from Locke or Hume in believing that what we were "experiencing" were only ideas (or perceptions or qualities) sent from God and not the things themselves, and he effectively chose to make knowledge of self and knowledge of God specific exceptions from the Empiricist mantra that experience is the source of all knowledge. Although Berkeley insisted that his theory was not skeptical in nature, and that he was not actually denying the existence of anything, it was largely received with ridicule at the time, and even those few who recognized the genius of the arguments were unconvinced by them (Dr. Samuel Johnson is reputed to have kicked a heavy stone and exclaimed, "I refute it thus!"). His "Three Dialogues between Hylas and Philonous" of 1713 was published as a defense against the criticisms his first work received. In it, the characters Philonous and Hylas represent Berkeley himself and his contemporary. In 1734, Berkeley published "The Analyst", a direct attack on the logical foundations and principles of calculus and, in particular, the notion of fluxion or infinitesimal change which Sir Isaac Newton (1643 - 1727) and Gottfried Leibniz had used to develop calculus. Berkeley saw this as part of his broader campaign against the religious implications of Newtonian mechanics and against Deism. It was arguably as a result of this controversy that the foundations of calculus were rewritten in a much more formal and rigorous form, using the concept of limits. Interestingly, and perhaps ironically, the 20th century philosopher Karl Popper (1902 - 1994) published a paper in 1953 called "A Note on Berkeley as a Presursor to Mach and Einstein" in which he described 21 theses from Berkeley's work and showed how they mirrored concepts in modern physics. In political economy, Berkeley was a thorough pessimist, perhaps explained by the miserable economic state of the Ireland of his time. He argued for government and Church intervention in creating the social climate for economic development in Ireland, and the doctrine of John Law (1671 - 1729) that "easy money is the engine of trade" was central to his policy arguments. His economics are perhaps best found in his "Querist" of 1737.